In an effort to support training and advocacy for court reporting services, the National Court Reporters Association (NCRA) and many of its representative traveled to Washington D.C. last week as part of a support effort for the Local Courthouse Safety Act. The event also featured a two-day 2013 Legislative Boot Camp. 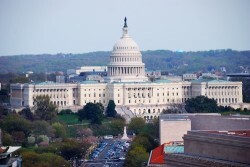 The NCRA, which represents broadcast captioners, court stenographers and CART providers, sent 40 of its state affiliate association leaders along with its national board of directors to Capitol Hill to lead the way at the event. The courthouse safety bill the NCRA is rallying around was first introduced in February 2012 by Sen. Al Franken (D-Minn.) and Sen. John Boozman, (R-Ark.). The purpose of the bipartisan bill is to take security equipment that is no longer in use by other federal agencies and use it to help protect courthouses and other legal facilities. It also calls for the government to re-allocate funds in order to train security guards for these facilities. "It is important to NCRA that members of the court reporting profession work in the safest environment possible and we are committed to doing everything we can to help ensure that scenario is a reality. Passage of this Act will provide a real and cost-effective deterrent for potential attacks on courthouses, and provide states with additional resources to deliver safeguards," said Jim M. Cudahy, executive director and chief executive officer of NCRA. The NCRA's efforts are reflective of the overall sentiment that the government needs to provide more resources for courthouses in order for the justice system to run more smoothly. If Wisconsin courthouses face budget cuts due to financial restraints, it becomes more important to ensure that there is a Milwaukee court reporter present at all hearings and trials. This entry was posted on Wednesday, March 20th, 2013 at 2:52 am	and is filed under All Posts, Court Reporting News. You can follow any responses to this entry through the RSS 2.0 feed. You can skip to the end and leave a response. Pinging is currently not allowed.